Up to get some leeks and carrots, as well as anything else I could find. 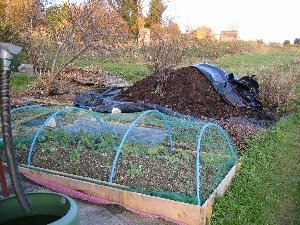 Noticed that the raspberries have gone dormant so took the fork to the ones growing out of the row and bagged them up for donation. Plot looks sad, as they are wont to do at this time of year. Still, shortest day is this week and then daylight is on the up! Spring cabbages doing well, or at least the pointy ones are. The others are surviving. View of bottom half; still have a fair few root crops in the ground. Food raid prior to skipping off to Weymouth. Got some leeks, a couple of cabbages, a big bunch of carrots and the usable parsnips. A lot of the larger ones are very cankery as well as spherical: perhaps I´ll have to adjust how I grow them next season. Thinking a forest of drainpipes upright in the ground! But given how many I want to grow, this might not be terribly cheap! Spent afternoon preparing veg. 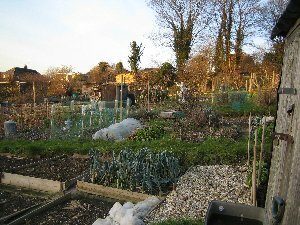 Christmas in Weymouth, but still managed to smuggle runner beans, marrow, garlic carrots, red cabbage and French beans into the in-laws´ kitchen. Spent a few hours trawling the seed catalogues for things I need for next season. Now need to double check the seed tins against the lists, as I expect some things I don´t need and there´s no point in buying new. At least this holds for some things. Parsnips I´ll have to get new as old seed doesn´t germinate very well (and parsnips are leery on germination at the best of times). Email arrived from Chris mentioning that the lotties had been visited by thieves who had nicked some sprouts and her best leek. Dropped everything and dashed up there - all the rest of my decent carrots had vanished and the netting was flapping a bit. Serious bit of grumbling. Luckily most of them had been picked a week beforehand and are still in a bucket in the kitchen, but it looks to me like someone knew what they wanted and just helped themselves. Least everything else seems to be there. Helped myself to another leek while I was there, since we´re having Christmas Dinner tomorrow! Chris got back to me and said Tony´s lost some leeks too. Jim knows and will no doubt discuss it with the committee next time they meet. Latest continues in January 2006!